In class this week, we've been looking at the factors that affect ocean currents. Thermohaline circulation is the name given to large-scale ocean circulation patterns. It refers to how differences in the densities between warm/cold water and fresh/salt water and how these different densities circulation patterns. 1. 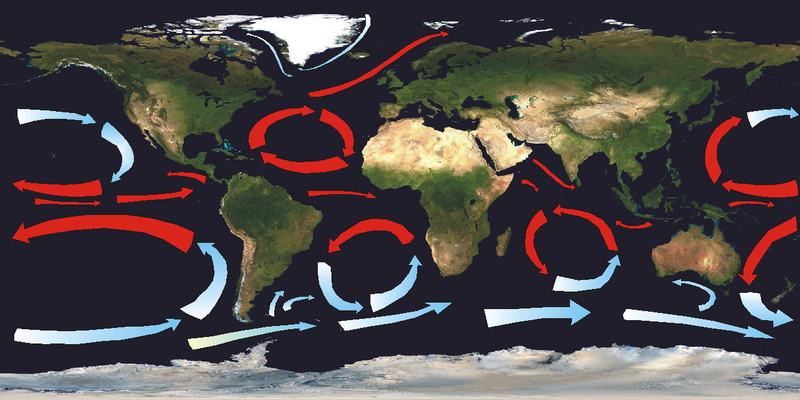 Surface currents - ocean currents that travel at or near the oceans surface. These tend to be warm water currents. The Gulf Stream in the North Atlantic is a great example of a surface current. 2. Deep currents - ocean currents that travel far below the surface of the ocean. These tend to be cold water currents. Differences in temperature really drive the ocean circulation. Warm water is less dense, causing it to rise to the surface. Cold water is more dense, meaning cold water will sink. Warm water flows from a low latitude (near the equator, where it's warmed) to a high latitude (the poles, where the water is cooled) as a surface current. The cold water flows back towards the equator as a deep current. The picture belows shows warm water sitting on top of cold water because of differences in density. Salinity, the total measure of dissolved salts or solids in a liquid, also affects density. Because of the differences in density, less dense fresh water will always sit on top of the more dense saltwater. The picture belows shows blue fresh water sitting on top of the clear salt water. Large influxes of freshwater to the oceans can slow or temporarily stop the thermohaline circulation because fresh water will not sink below the more dense saltwater. In the picture below, knowing that one container holds saltwater and the other fresh water, can you determine which jar holds which type of water?